This incredible trip allows you to explore some of the wonderful Hawaiian islands including Honolulu and Kauai. Discover the individual charm of each island and immerse yourself in the culture. Head on a Volcano National Park Twilight Tour, a catamaran cruise of the Na Pali coast and an Ultimate Kauai Adventure Helicopter Tour. You will be staying in some of the best hotels Hawaii has to offer, making your holiday a very special experience. This holiday is perfect for those who are looking to soak up the Hawaiian island vibe and experience some wonderful excursion. Fly to Hawaii. Spend your days relaxing at the hotel, or take a stroll around the local area exploring. Whilst in Hawaii, we’ll arrange the Volcano National Park Twilight Tour. Journey deep into Hawaii Volcanoes National Park and explore the Big Island’s lava-fueled ecosystem. During this Big Island volcano tour, you’ll hike on maintained trails to see the active Kilauea, some of the rarest plants on earth, and breathtaking sunset views of Mauna Kea and Mauna Loa. You’ll stay energised with lunch and dinner at restaurants in towns near the park. Start this incredible 12-hour tour with a visit to Mauna Kea and Mauna Loa, which are two of the world’s largest volcanos. The area is very special as it is home to some of the rarest plants and animals in the world. Enjoy a spot of lunch at Mauna State Park, continue east towards Hilo, where you will explore a lava tube. 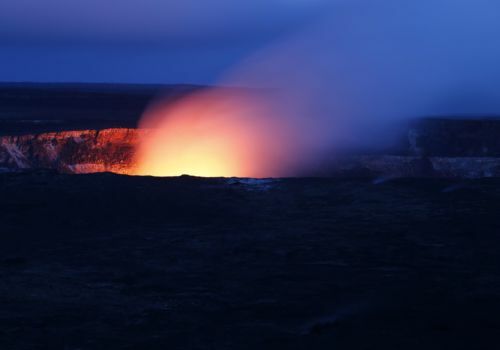 Be spellbound by the incredible passage which once carried molten rock from Mauna Loa’s upper rift zones to the ocean. From there, you will be taken into the Hawaiian Volcano National Park via the Crater Rim Drive. In the park, you will visit many interesting points including the active volcano Kilauea. You will be led by a guide on a moderate hike, where you will break to look at points of interest in the park. It’s not guaranteed that you get to see lava flowing firsthand on this hike, but your guide will do their best to take you to prime viewing spots if the conditions are safe. When Kilauea isn’t erupting, you actually get to walk the summit caldera, peer down steam vents and marvel at the cinder fields. Such dramatic displays aren’t the only natural wonders of the park. You’ll also explore trails carved into a native rainforest before. You will then be taken to a spot where you’ll get to see active lava glowing at twilight. Your Big Island volcano tour is topped off with a delicious sit-down dinner in the heart of Pahoa, an old plantation village. Spend some time relaxing, but be sure to visit Pearl Harbor, which is undoubtedly one of the most historic locations in the United States. Today, Pearl Harbor remains an active military base and is steeped in history. Visit the locations of the surprise attack that started it all, to the surrender of the Japanese on the deck of the mighty Battleship Missouri. 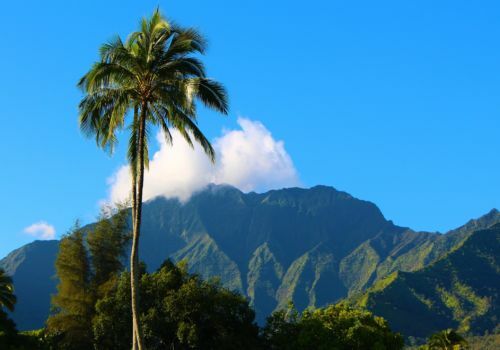 Fly to Kauai, a luscious green island that has nature at its heart. Take a fun-filled catamaran cruise of the Na Pali coast. Snorkel, view towering sea cliffs, waterfalls, sea caves, pristine beaches and remote wilderness coastline on this island. If you are lucky you may spot some spinner dolphins, turtles and humpback whales. Whilst in Kauai, you will be taken on an incredible helicopter ride around the island. Guaranteed you won’t get a better view than up in the sky! This circle island flight features many famous areas that have made the “Garden Island” a favourite for Hollywood filmmakers with over 75 film productions made on the island to date. The professional pilots will take the time to share with you the grandeur of Kauai that attracts visitors from all around the world. Your flight will take you into the 10-mile long Waimea Canyon, dubbed the Grand Canyon of the Pacific by Mark Twain. The legendary Na Pali coast, with its dramatic cliffs chiselled by time to a razor’s edge, beckoning, spellbinding, no matter how many times you see it. See Kauai with its green verdant valleys and numerous secluded beaches – gaze at the breathtaking waterfalls that plummet over 2,000 feet to the ground from Mt. Waialeale Crater, known as the wettest spot on earth with an average of 460 inches of rain yearly. See Wailua Falls made famous in the opening scenes of Fantasy Island and much more. This flight will create memories of a lifetime.